Every year, more building owners opt to “go green” as a way to save money and contribute to a healthier environment. Many sustainability standards and indices have come along, but how do you know which ones are the most important ones for your building project? Energy efficiency, recycled content, what happens at the end of a product’s lifecycle, impacts on health, packaging, and shipping are just a few of the areas covered. LEED (Leadership in Energy and Environmental Design) – This is the foremost worldwide standard for “green building” of commercial properties. 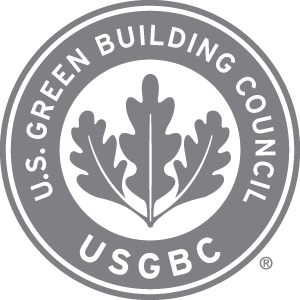 By seeking LEED Certification via the U.S. Green Building Council, building owners commit to taking steps to create healthy, efficient, cost-saving environments. Openings products may qualify for LEED credits in the Energy & Atmosphere, Materials & Resources, Indoor Environmental Quality, ASSA ABLOY provides a resource center outlining LEED documentation pertaining to door openings. WELL Buildings – The International WELL Building Standard focuses solely on helping architects and owners create buildings that positively impact human health and well-being. Projects are evaluated and scored on criteria pertaining to air, water, nourishment, light, fitness, comfort, and mind. Doors and hardware can contribute to multiple features in the categories of air, light, comfort and mind. Living Building Challenge – This rigorous building certification program from the International Living Future Institute includes elements of philosophy and advocacy. To earn certification, projects must meet requirements over at least one year of occupancy, with a focus on operating cleanly, beautifully and efficiently. 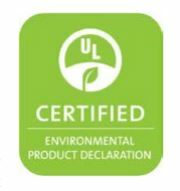 EPDs (Environmental Product Declaration) – as detailed by UL, an EPD report documents the ways in which a product, throughout its lifecycle, affects the environment. EPDs help decision makers better understand a product’s sustainable qualities and environmental repercussions. When it comes to openings, EPDs review factors related to: energy efficiency; impact on human health, water and air quality; recycled content and end-of-life disposal; and shipping. Several types of commercial doors and hardware have qualified for EPDs, as shown here. HPDs (Health Product Declarations) – The Health Product Declaration Collaborative is an impartial group that helps manufacturers scrutinize materials and processes used in production as they relate to human health. HPD statements detail the contents of a product, any known toxicities, and certifications, giving building owners all information needed to improve the environment and create healthy buildings. To understand more about how openings components can contribute to healthy buildings, see ASSA ABLOY HPD Statements for doors and hardware. 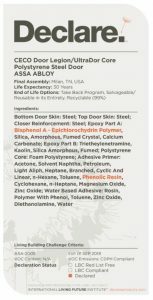 Declare Labels – Designated by the International Living Future Institute, a Declare label shows ingredients in the product that meet rigorous performance standards aimed at advancing sustainability in the built environment. This stringent building certification program helps building owners use resources more efficiently and reduce waste, and more. 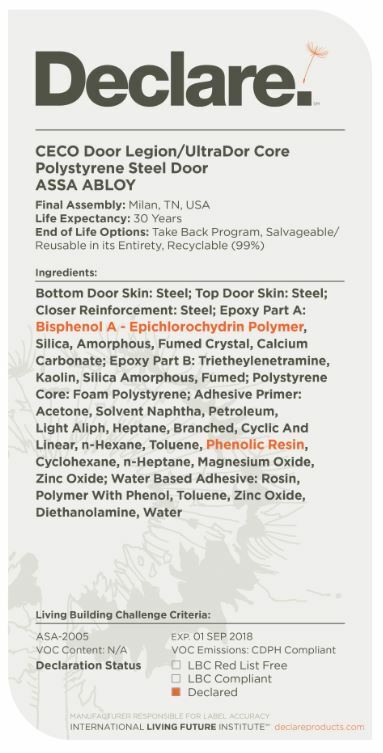 Products that meet criteria are designated with a simple Declare label stating the product’s features (examples from ASSA ABLOY doors & hardware here). If you focus on these 6 standards, or a combination thereof, you’ll be on the right track for earning key documentation to advance your sustainability goals. Additional helpful information on “green” products for buildings, and how they can save on long-term costs can come from reviewing Sustainability Reports of building materials manufacturers (readily available online), understanding internal goals of companies within the supply chain, and attending industry tradeshows highlighting sustainability, such as GreenBuild and the Living Product Expo. How Do Doors, Hardware and Accessories Contribute to LEED Projects?